This pages lists details of my journal articles, books and books chapters, research reports and unpublished papers. Where available I have provided a link to the final online version of each paper. Where, due to copyright, this is not possible, the accepted manuscript has been been uploaded in its unpublished form or I have provided a link to the publisher's site. If the publication you are seeking is not here you are welcome to email me with a request for further information. http://www.reimaginingsocialwork.nz/2019/03/watch-what-you-say-radicalism-in-community-development/ Article posted 28 March 2019. Westoby, P., Lathouras, T. & Shevellar, L. (in press). ​Radicalising community development within social work through popular education – A participatory action research project. British Journal of Social Work. Accepted 15 February 2019. Westoby, Peter & Shevellar, Lynda (2019). “Singing up the second story”: Acts of community development scholar “Delicate Activism” within the neoliberal university. In Resisting Neoliberalism in Higher Education Volume I. edited by Dorothy Bottrell and Catherine Manathunga. Cham, Switzerland: Palgrave Macmillan.205-222. ​Shevellar, L. & Westoby, P. (eds). (2018). The Routledge Handbook of Community Development Research. London: Routledge. ​Shevellar, L. & Westoby, P. (2018). Wicked problems and community development – an introductory essay. In L. Shevellar and P. Westoby (eds. ), The Routledge Handbook of Community Development Research (pp. 3-19). London, United Kingdom: Routledge. ​Westoby, P. & Shevellar, L. (2018). What have we learned? A concluding essay on wicked problems, research and the contributions of community development. In L. Shevellar and P. Westoby (eds. ), The Routledge Handbook of Community Development Research (pp. 285-292). London, United Kingdom: Routledge. Shevellar, L. (2016). Safeguarding the soul of the CBO. In P. Westoby (Ed). Soul, community and social change. Surrey, UK: Ashgate. Westoby, P. & Shevellar, L. (2014). Beware the trojan horse of professionalization: A response to De Beer et al. (2012) Africanus 42(2): Review. Africanus, 44(1), 67-74. Westoby, P. & Shevellar, L. (Eds). (2012). Learning and development for community development: A radical tradition of community based education and training. Surrey, UK: Ashgate. Westoby, P. & Shevellar, L. (2012). Introduction. In Peter Westoby and Lynda Shevellar (Ed. ), Learning and mobilising for community development: a radical tradition of community-based education and training (pp. 1-12) Surrey, United Kingdom: Ashgate. Westoby, P. & Shevellar, L. (2012). A perspective on community-based education and training. In Peter Westoby and Lynda Shevellar (Ed. ), Learning and mobilising for community development: a radical tradition of community-based education and training (pp. 13-24) Surrey, United Kingdom: Ashgate. Shevellar, L. & Westoby, P. (2012). Tracing a tradition of community-based education and training. In Peter Westoby and Lynda Shevellar (Ed. ), Learning and mobilising for community development: a radical tradition of community-based education and training (pp. 25-40) Surrey, U. K.: Ashgate. Westoby, P. & Shevellar, L. (2012). Conclusion: a community-based education and training framework. In Peter Westoby and Lynda Shevellar (Ed. ), Learning and mobilising for community development: a radical tradition of community-based education and training (pp. 205-220) Surrey, United Kingdom: Ashgate. Shevellar, L. (2011). Transformative learning and the dynamics of power: 'Poised on the precipice of risk'. Education and Society, 29(1), 45-59. Shevellar, L. (2011). ‘We have to go back to Stories’: Causal Layered Analysis and the Community Development Gateaux. Community Development (JCDS), 42(1) pp. 3-15. Ryan, Y. , Zuber-Skerritt, O. & Shevellar, L. (1998). Fourth manual for conducting workshops on postgraduate supervision of non-English speaking background students 2nd ed. Lismore, N.S.W. : Institute for Workplace Research, Learning and Development (WoRLD), Southern Cross University. Zuber-Skerritt, O. & Shevellar, L. (1996). Fourth manual for conducting workshops on postgraduate supervision of non-English speaking background students. Lismore, Australia: Southern Cross University Press. Latest publication: Barlott, T., Shevellar, L., & Turpin, M. (2017). Becoming minor: Mapping new territories in occupational science. Journal of Occupational Science, 4(24), 524-534. Accepted 01 Aug 2017, Published online: 27 Sep 2017. Shevellar, L. & Armstrong, J. (in press). Re-Thinking respite in aged care. In R. Held, J. Armstrong, & R. Lemay (eds). SRV and Ageing. Plantagenet, Ontario: Valor Press. Shevellar, L. & Sherwin, J. (2015). Choice, ideology and the challenges of applying social role valorization in mental health work. SRV Journal, 9(2), 45-56. Shevellar, L., Sherwin, J. & Mackay, G. (2012). A re-imagined identity: building a movement in Brisbane for the practice of social role valorization. In Peter Westoby and Lynda Shevellar (Ed. ), Learning and mobilising for community development: a radical tradition of community-based education and training (pp. 81-94) Surrey, United Kingdom: Ashgate. Shevellar, L. (2008). “I Choose To Be a Person of Integrity:” A Model for Constructive Relationships Between Human Services & Their Bureaucracies, SRV Journal 3(2), pp. 6-17. Shevellar, L. (2005). Editorial: Discovering the deep well of resilience. CRUcial Times, November, 34, pp. 1-2. Shevellar, L., Pacey, S. & Collins, P. (2005). On being the change we want to see: A collection of writings from CRUcial Times and CRU's occasional papers. Volume 3. Brisbane, Australia: Community Resource Unit, 2005. Shevellar, L. (2003). Presence and Participation: The experience of people with disabilities in the search for freely given relationships. Brisbane: Community Resource Unit. ​Westoby, P. & Shevellar, L. (2018). From ‘dilemmatic space’ towards ecological practice: Community development in disaster recovery in Queensland, Australia. In L. Shevellar & P. Westoby (eds. ), The Routledge Handbook of Community Development Research (pp. 253-266). London, United Kingdom: Routledge.253-266. Shevellar, L. & Riggs, R. (2015). Understanding resistance to disaster messaging. Australian Journal of Emergency Management, 30(3), 31-34. Shevellar, L., Westoby, P. & Connor, M. (2014). Flirting with danger: Practice dilemmas for community development in disaster recovery. Community Development. Shevellar, L. & Westoby, P. (2014). Perhaps?” and “Depends!" The possible implications of disaster related community development for social work. Advances In Social Work & Welfare Education Special Issue 2015: ‘Disaster curriculum for social work’, 16(2), 23-35. Shevellar, L., Connor, M. & Westoby, P. (2014). The role of community development in building resilience in response to disasters: The Queensland experience. Practice Insights, 3, Winter, 4-5. Connor, M., Shevellar, L. & Westoby, P. (2013). Getting back on your feet: Community development work and natural disasters. St Lucia: School of Social Work and Human Services, The University of Queensland. Antrobus, E., Cheshire, L., Connor, M., George, N., Madsen, W., Ramirez, S., Shevellar, L., Walters, P., Westoby, P. & Wickes, R. (2013). Identifying and Evaluating Factors Influencing Community Resilience in a Crisis. Queensland Centre for Social Science Innovation, Final Report. Shevellar, L. (2010), Submerged, Antipodes: A North American Journal of Australian Literature, December, 198. Ling, L., Wilson, J. & Shevellar, L. (2017). Managing everyday living: Microfinance and financial capability. In Dong, Y., Hou, W. & Sen, B. (Eds. ), Microfinance for entrepreneurial development: Sustainability and inclusion in emerging markets (pp. 107-125). New York: Palgrave Macmillan. Shevellar, L. & Marston, G. (2011). Exploring the role of fringe lenders in the lives of Queenslanders. Australian Journal of Social Issues, 46(2), 205-222. Marston, G. & Shevellar, L. (2010). 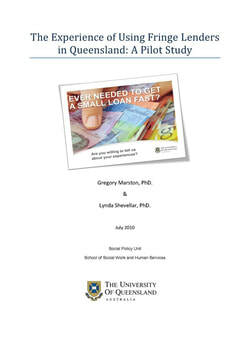 The experience of using fringe lenders in Queensland: A pilot study. St Lucia: Social Policy Unit, School of Social Work and Human Services: The University of Queensland.